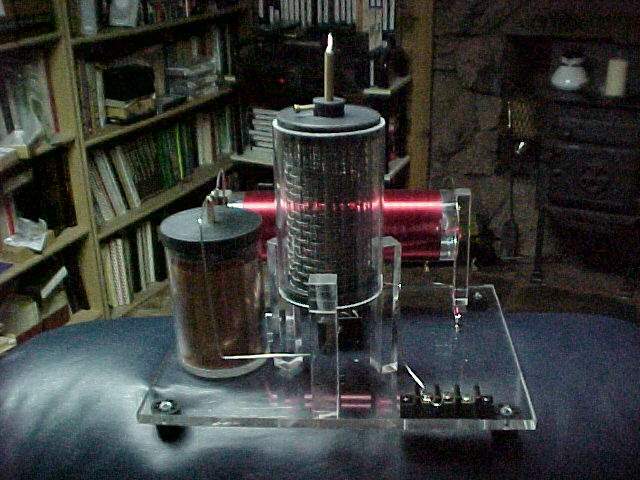 Peter Lindemann has discovered an important connection between the mysterious power conversion tube patented and used by Ed Gray with his high voltage pulse motors and Teslas use of unidirectional pulses to produce a wide range of phenomena as detailed in his new book and video which are available on his website. Additionally, Peter has posted many historical files about Gray, Tesla and other correlations to get the ball moving to try to rediscover and duplicate the phenomena demonstrated by Ed Gray. Peter will be lecturing on this subject in his 'World of Free Energy' presentation at the KeelyNet Convergence conference on June 16/17, 2001 in Dallas as posted at http://www.keelynet.com/knconf.htm. Conference registration is still open for online purchase, through the mail or directly at the door on Saturday morning. Two of the original Ed Gray motors will also be shown and another version developed by Doug Konzen will be demonstrated. The following series of email exchanges are from the KeelyNet Interact discussion list as so very kindly shared by John Bedini and Robert Calloway. 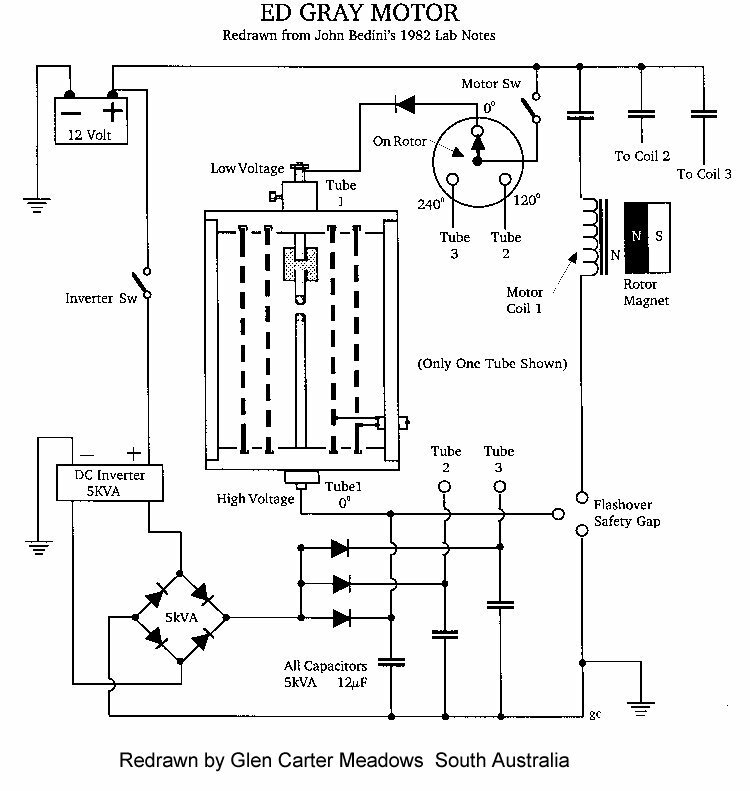 John further ripped the veil of secrecy on the power tube by sending his 1979 experiment photo and lab notes for everyone to study. Jerry - You can drag me into this all you want, The answers have been given to everybody, every time I posted something with you, AS I SAID BEFORE THERE IS NO SECRET TO GRAYS MACHINE I DO NOT KNOW WHAT IS SO MAGICAL ABOUT A HIDDEN TUBE THAT GRAY HAD. I have given Peter the lab notes from my files on gray's tubes when Ron and I went to visit him . Peter came to visit Me he knows what I can do with My machines. I asked him kindly to not say anything that I was working on, this was my own request until I'm ready. Back to gray's tube and motor. I have given peter My lab notes on this tube He has my permission to do anything he wants with them. Peter has given you all the answer not only in his book but in your discussion group, but once again, "WE ARE ALL BLIND". First of all the motors shown on the internet are something different Gray was working on. """""" THE COILS ARE NOT THE SAME AS THE MOTOR I HAVE SEEN IN THE EARLY DAYS"""""""" what does this say to everybody?????? Can anybody answer Me as to how these tubes work,,, NO BECAUSE YOUR LOOKING FOR THEM, YOU WON'T FIND THEM, and no one can make them if you do not understand them. TESLA USED THE SAME TUBES THAT RAN HIS CAR!!!!!!!!!!. I have also said that the school girl motor gave all the answers to the problem of free energy. Their is not going to be any kit that somebody can buy at radio shack, Research into this field takes real hard work. The Swiss machine uses the same tubes, WHY BECAUSE THIS IS THE ONLY WAY TO CHANGE THE FORM OF ENERGY TO SOMETHING USEABLE. Splitting the Positive what does this mean, it means that one lower form of positive energy is transformed into a higher form, but they are the same potential energy except useable now to do work "REAL POWER IN WATTS" or if you would say AMPS times VOLTS. IT TAKES TIME TO STORE THE CHARGE TO SOME POTENTIAL BEFORE YOU CAN USE IT FOR DISCHARGE into something. Into something meaning a storage battery or some load that the meters can measure. Closing the loop YOU CAN'T, free energy does not work this way, loops are never closed in any machine that's over unity. THE TWO ENERGIES ARE DIFFERENT because the two POSITIVES ARE DIFFERENT they are at the same potential but one weak, one collected and strong in discharge . Stored charge, Time, discharge to something , no closed loop, these are the keys to free energy , and it's not free you must work to get it. By the way the motor runs without the tube, just a little stronger with it and time delayed. Someone answer how the tubes work and we will have a real discussion on Gray, and then comes a picture of a pro-type tube taken with a digital camera that I built some time ago for a different machine. And you can post this..
Hello Jerry and all, Having spent countless hours studying and building John Bedini's motors, I think some confusion exists between John's explanation of what is not being understood and Tom Bearden's explanation of what is going on in these motors. This email is not intended to debunk either one of them, only to try and explain how his design of motor works from my point of view. If one has never built a pulsed motor you will not realize what is being overlooked until having done so. S1 has always held the secret in John's schematics, and I followed right along behind him in my drawings. If you place a arc gap at S1, a increase in voltage occurs. If you collect S1 in a capacitor and time it to discharge into ANOTHER battery via a arc gap (getting it out of the loop) the potential is multiplied. How much is how long you TIME the wait. What some fail to see is these motors use sparse milliamps to run compared to the output at S1 if stored in a capacitor and TIMED to release through the arc gap into a different battery. THAT'S THE SECRET. John shows this in several of his schematics everywhere on the web. If you release the stored energy in the capacitor back to the working or same battery, the excess will "ghost", you will never see it. John has got it very correct..STORED CHARGE, TIME, DISCHARGE, NO CLOSED LOOP. How this happens? I don't know, but it works. Thought you might like to see this which Robert posted to the list....seeya! Jerry - This is the best I have seen, Robert has got it so you guys win the tube and how it works, Robert is right now it's time to understand how you get the energy, the energy is produced in the back EMF or the spikes only , but they are not useable until they are converted by the cap for discharge into a secondary battery but at the right time. 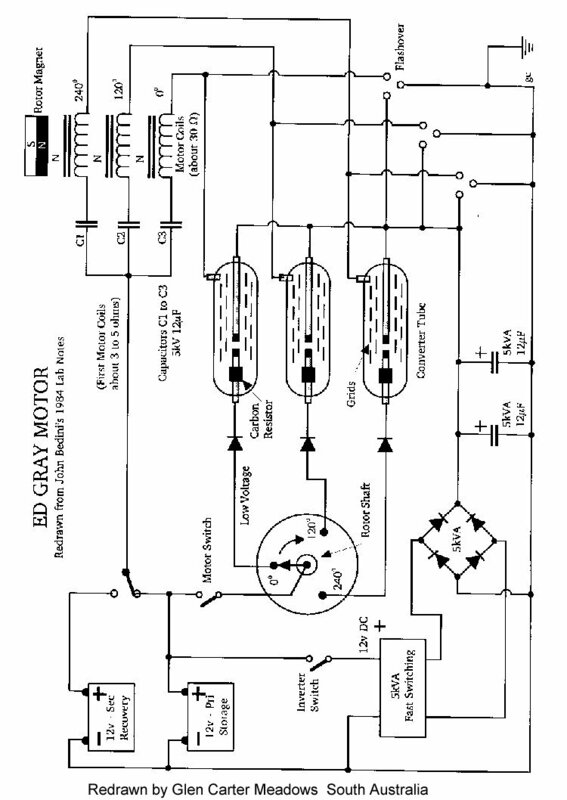 So here it is EV Gray, He knew this so He had to developed a different standard A new motor with more inductance in the coils , No re-charge coils are needed because the power coil supplies all the energy in spikes, You know the thing every engineer shorts out with diodes because it burns out their circuits. You can produce free energy any time if simple rules are followed. Their is no hidden trick here. depending on how much energy is needed this is all timing to produce the correct voltage level for discharge into the battery, I have said you can not close the loop so therefore the 1 watt challenge is out and has no meaning except to confuse everybody and through you off the track. Robert is right in saying that you are just ""Ghosting"" to feed back to the same battery. If you study the EV Gray tube you will see that the tube uses two electrodes, a high voltage electrode and a low voltage electrode the low voltage side is on the primary battery and the high voltage side is on the 3000volt side when a arc is drawn from the timing rotor this completes the circuit between the two positives, one from the inverter and one from the battery positive all grounds are connected to the same point. now subtract the differenceof the twelve volts and you have the real voltage or 2988 volts, but this is high voltage and can not be used so the conversion takes place in the tube on the grids. 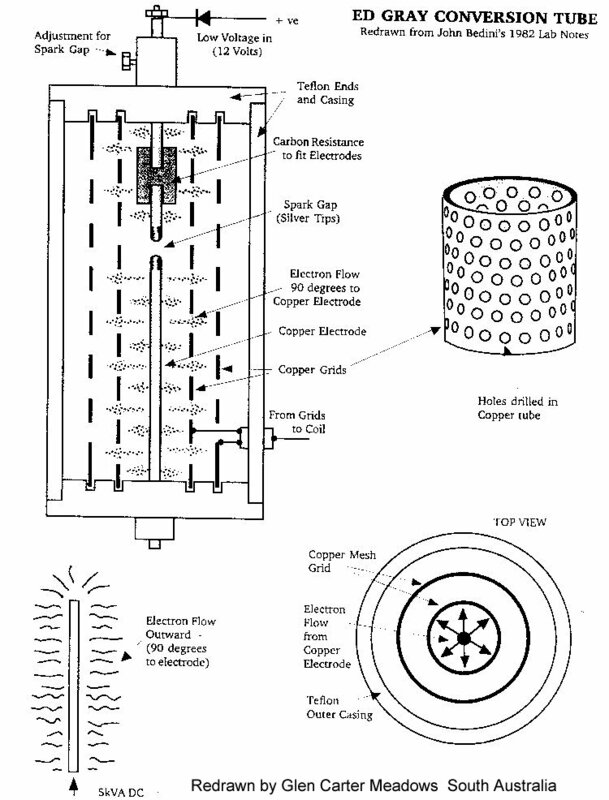 The ARC is emitted electrons (which) fly off the electrodes and get stored on the grids this is the cold Electricity Gray talked about and how it was collected. If this is true then an antenna connected to a coil of so many turns is rectified and stored into a laden jar cap. The gap on the tube is set to say 1/32, when the discharge takes place the cold electricity sent out through the grids to the storage battery you are charging and you do this for free. And you did not close the loop to short it out. Gray was too close to providing the world with free energy with just an antenna of any kind,,,,,, SO THEY KILLED HIM. So we have the Swiss machine that works the same way, we have Grays Machine , and we have the car that Tesla built that works the same way. They all use the same tube just different variations. You can make this anyway you want to experiment with, I used this as a medical machine with light currents for treatment with one electrode. Try this experiment, take three flashlight batteries put two on one side in series and one on the other side connect the two negatives together, now between the two + poles connect a light, this is splitting the positives.This has been on my pages forever, but nobody unerstood it. Jerry please post this for the group. 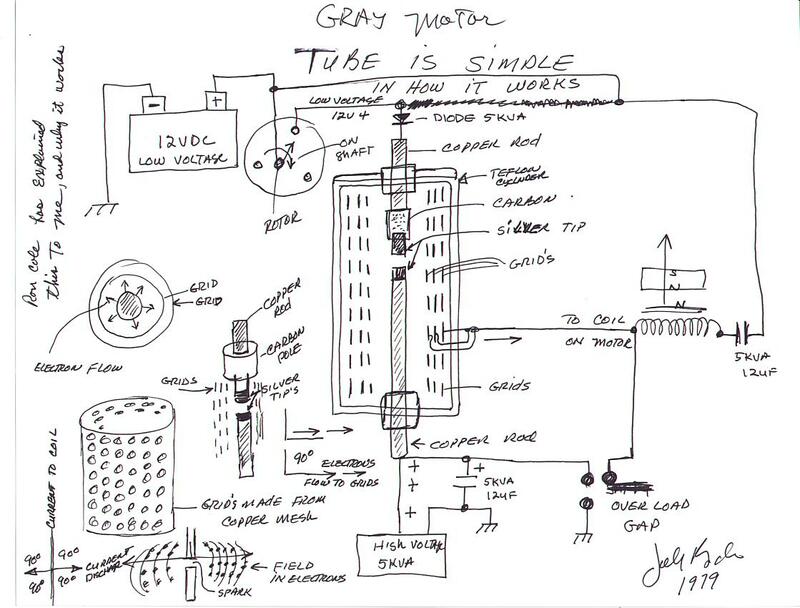 Jerry - You do what you want with the picture, this tube is very hard to make requires milling machine to do and no it's not My version It's grays tube this is what was hidden inside of the Swiss machine and what Tesla used also Gray I will send you the lab notes, but I'm sure Peter will give them to you. Robert is the one, He did real good in the answer. post the tube if you want these tubes are about 3" in diameter grid spacing is 1/4 " between grids 5" long 1/4 inch brass rods with silver gaps.